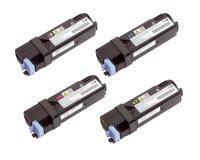 This set includes all four individual color cartridges: Cyan, Magenta, Yellow & Black Toner Cartridges. 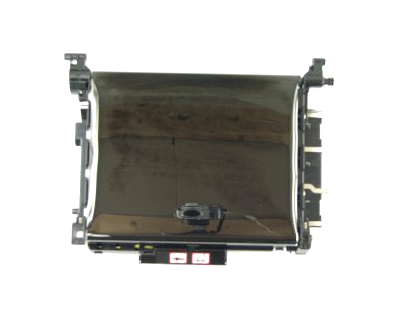 This product comes with a 6 month Warranty against any defects (including free replacement). We stand behind our products 100%, as these are not manufactured by Dell. 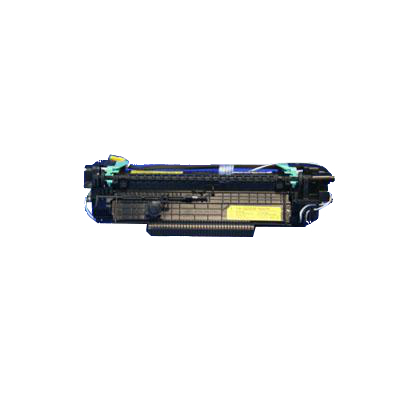 When one or more of the Dell 2135CN’s toner cartridges requires replacement, begin by opening the side cover of the device. 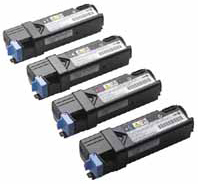 The toner cartridges are latched into place by labeled switches that must be pulled back to release the proper cartridge or cartridges to be replaced. 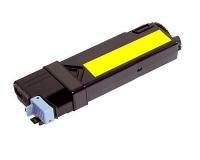 Once unlatched, pull open the cartridge holder(s) and slide the old toner cartridge out. 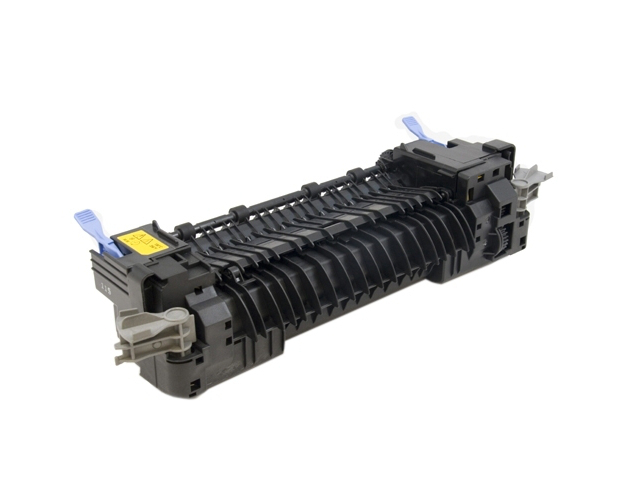 Do not shake used toner cartridges. Select the correct color new cartridge to be installed and remove it from its box. Shake the cartridge several times before installing it. 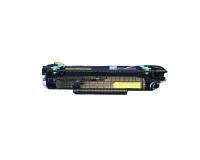 Insert the toner cartridge into the correct toner holder, being especially careful when changing more than one cartridge at once, then close the holder and lock the latches. Close the side cover and the installation is complete. Before performing this procedure, always unplug the printer to avoid electric shock. It is best to clean the separator periodically to maintain the best possible copy quality. Begin by removing all paper from the paper tray and pull it completely out of the printer by lifting the front of it as it is pulled free. The retard roller has two tabs, one on either side of it, that can be pinched with the hand to unlatch it from the paper tray. Slide the old roller out of the groove. To install a new retard roller, align it with the roller groove as the old one was. Slide it down into the axle until it snaps into position. The roller hook at the bottom of the roller should lock into place, as should the two locking tabs on either side of it. Load paper back into the tray if desired and slide it into back into the machine. Don’t be dissuaded by the Dell 2135CN’s sinister looks. 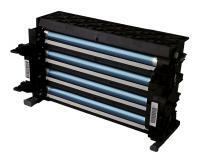 This all black multifunctional printer operates in full color and comes at a very low price. Its specifications are somewhat run of the mill across the board, as it fails to really impress in any one particular area, but the unit is sure to please a small office looking for a basic set of color laser printing tools. Along with the simple fact that the Dell 2135CN can print in full color, it has much to offer. The unit is quite large, though it only holds 250 sheets worth of paper. Its duty cycle of 40,000 pages seems just about right for a unit of this magnitude; allowing a network of people to produce plenty of work from the machine in the span of a month. The head to toe black design of the Dell 2135CN is noteworthy, channels Darth Vader quite well, but is also highly functional. The floating scanner allows for a convenient paper path, with the unit’s output tray actually sitting underneath the scanner. This allows the device to function without the need for the usual fold out paper trays. The design also incorporates a side door for toner access which is a great convenience when replacing consumables. With a 400 MHz built in processor, you would think that the Dell 2135CN would be able to execute faster print speeds than it can. Still, 400 MHz is impressive, and the device’s standard memory is at least respectable as well at 128 MBs. Memory can be expanded up to a total of 384 MBs which, though expensive, is highly recommended to keep speeds up when dealing with large imagery or PDF files. An Ethernet port is made available for networking, as is a standard USB 2.0 port that supports a high speed connection with a single host PC. 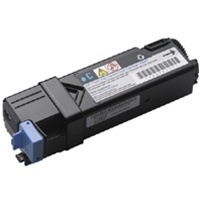 The print languages understood by the machine are PCL 5/6 with 81 fonts, and the device is compatible with a variety of Windows formats making setup relatively easy. 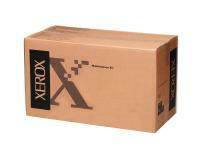 The unit could also conceivably even be used as a stand alone copy machine or fax machine without any PC setup at all. 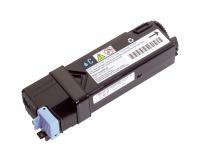 The Dell 2135CN lacks a manual duplexor, which is quite a disappointment for an otherwise well rounded machine. If two sided printing is only needed on occasion, Dell makes duplexing available with two different manual duplex options which are not too cumbersome. Still, the incorporation of an automatic duplexor in a network ready color multifunctional machine seems like it should be standard. The real downside to this older model, however, is its print speed. With only 16 pages per minute maximum for black and white printing and an even slower 12 pages per minute for color, both rated for letter sized paper, the Dell 2135CN is one of the slowest models available. 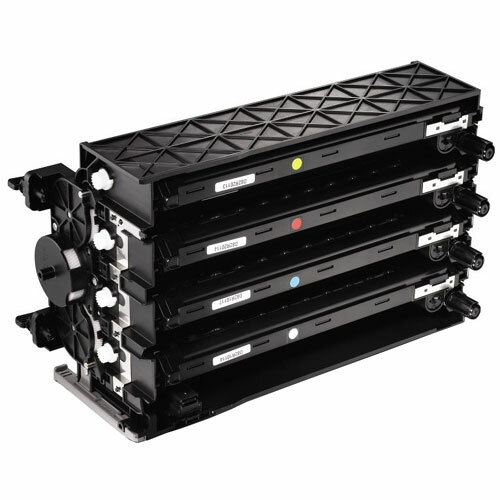 Being released in the early days of color laser technology, its hardware cannot compete with the affordable, reliable, and fast color multifunctional desktop printers and copy machines on the market today.